It’s ok to need a break. In fact, I need one right now. Our sweet baby girl just woke up at 3 a.m. screaming from what seemed like a bad dream. I had finally just sat down to write my blog post for “Marriage Monday” but had not even hit a key yet when she woke up. Now, I don’t even know what I was going to write about. I feel like that a lot lately. Like I don’t even know. I don’t know what tomorrow holds, what next week will bring, and in reality most days I don’t even know what we will be having for dinner! I don’t like not knowing. I used to be able to plan well. Ask anyone that knew me in Chi Alpha in college. I was the one with the color coded daily planner. I had my day planned down to each hour. Life was easier to plan then. I had classes, chi alpha events, and work. Those three things for the most part took up my days. Now, I don’t have any thing that structured to plan my days around. My husband’s work hours are never the same. So no planning there. Our daughter’s sleep hours are never the same. So no planning there either. I am left trying to fit a break somewhere between the two. It’s ok to need a break. When my sweet husband is done working for the day I don’t want to just toss our kid at him and run for my life…well… maybe sometimes I do… but I can’t. I want to spend time with him as well. And he usually needs a bit of a break at the end of a long work day. I get that, so, my break gets put off a little more. What I am referring to as a “break” in that last sentence is simply a shower. But to me it is no longer “simply a shower.” It is 10-15 minutes of alone time. I can shut my brain off and take a break. I can pray, brainstorm, or try to plan without our sweet toddler trying to break the sound barrier with her very high pitched squealing screams in the background. However, sometimes she does sneak in the bathroom giggling as she is running from daddy to try and come tell me hello! I don’t know the answer to me getting a break. But I do know that it’s ok for me to need a break (and you too! )… I also know that God knows we need rest. He knows that sometimes we are weary and burdened. When life is stressful and you don’t even know what is going on… go to Him… and He will give you rest. It’s ok to need a break. When life is making you stressed and rough around the edges… maybe even sharp… before you cut someone (emotionally) learn from Him and be “gentle and humble in heart” and you will find rest for your soul. It’s ok to need a break. How do you go to Him? How do you learn from Him? I would Love to hear from you in the comments below! I reply to every one because each of you matter to me. At several points in my life I have had to put myself out there if I wanted to make new friends. I had to make a choice to not live a less than life. The earliest I can remember would be when I left my hometown and went to college. I only moved an hour away BUT and hour felt like an eternity while sitting alone in my dorm room. I had left behind my family and my friends from high school. I knew no one at my new school. But God knew me and where I needed to be. Thank God for a group on campus called Chi Alpha. On my move in day they were helping people move in to the dorms. One of them was very observant and noticed that I had a shirt on from my church and struck up a conversation with me. Her name was Meeke. And to be honest… I don’t remember the conversation. What I DO remember is that a few days later on campus I hear my name being called from a ways behind me… so I turn and there she is! She remembered my name… that really surprised me. We walked back to the dorm together and she invited me to Chi Alpha’s weekly Thursday night meeting. I was sort of hesitant but she said she would save me a seat. She had done her part. She had done all she could… aside from dragging me there! It was now up to me. So, I went to the Chi Alpha meeting… TNL (Thursday Night Live) is what it was called then. That night changed my life. She saved me a seat… she really saved me a seat! And I don’t know if I ever told her this but… that night was a turning point for me. I already knew God and believed in Jesus and His sacrifice on the cross. I knew then that I would go to Heaven if I died. So I didn’t get “saved” that night. But… I got saved from a less than life. My eyes were opened wider than ever before to see God for who He really is and the big and wonderful plans He had for my life. I started to experience His amazing Love and the deep fellowship that came with being true brothers and sisters in Christ in a way I never had before. It was in Chi Alpha (XA) that I formed amazing friendships and a life long bond thru experiences with some that will last forever. It was in XA that I got filled with the Holy Spirit. It was in XA that I was taught how and began leading a Ladies Bible Study. It was in XA that I led worship for my mission trip team for the first time. It was in XA that I led a mission trip for the first time! It was in XA that I learned how important it is to really step out. After experiencing all God showed me then I never wanted to live a less than life again. And God didn’t want me to. God used Chi Alpha and all the amazing things that happened in my life during my time there… to teach me that I am not meant to go through life alone. That friends are important. And that faithful friends are worth the search. Over and over again… they are worth the search. Faithful friends who will pray for you as if your need was their own, who will Love you thru your brokenness, and who will hold your hands up when you are too weak. If every time life has thrown me a curve ball… I had just retreated to the dug out… I would have missed out on sooo much. If when I had to suddenly uproot my life and move back home… I had just hidden myself away to avoid hurt or being let down again… I would have missed meeting my husband. If when I was dealing with traumatic things involving my family… I had let myself put walls up to keep from sharing too much with new friends…in order to avoid getting hurt again… I would have missed the opportunity to trust again. I now realize not every pitch is a curve ball. And I am probably missing out on a home run if I just sit “safely” in the dug out! I am also not enjoying the game if I am stuck on the bench. Forgive the cheesy analogy BUT… it’s true! The devil wants nothing more than for you to do… nothing. You could be the home run hitter on your team but if you stay in the dug out… it doesn’t matter. In the body of Christ… we need each other. We are meant to operate together to fulfill God’s purposes. We are not meant to live a less than life. Don’t live a less than life! Do whatever you have to do to be a part of the body. 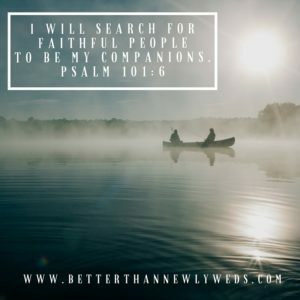 Search until you find faithful people to be your companions! Do not sit in the dug out and miss the point! Don’t miss all that God has for you! Don’t live a less than life! Find a Bible study to join… one full of the Word and overflowing with God’s Love and evidence of the Holy Spirit. What are you waiting for? I waited because I was scared. I should have searched for “Faithful People” so much sooner than I did. I was living a less than life. The devil had me worried about getting hurt again… but my sitting in the dug out not only hurt me but also the body of Christ. We were not meant to live a less than life. Jesus died for us so that we could have life and life abundantly! BetterThanNewlyweds.com is a participant in the Amazon Services LLC Associates Program, an affiliate advertising program designed to provide a means for sites to earn advertising fees by advertising and linking to Amazon.com. All opinions expressed in these reviews are our own. We only bring you the products. *Disclosure: On occasion, “affiliate links” may appear on this website. This means that when clicked and the item is purchased, the seller sends me an affiliate commission. This helps me keep this blog up and running. The item’s price is not affected in any way. Only items I believe my readers will enjoy are linked in this way. Information is shared for educational purposes. Ownership of content remains with it's original publisher. If you feel we have made an error please contact us know so we can remedy the situation.